Jump forward a week, after hours of re-executing SOLMAN_SETUP phases for System Preparation, Basic Configuration, Managed Systems Configuration, and finally Technical Monitoring we were able to see some monitoring. Below is a quick video overview of what's in SAP Solution Manager's Technical Monitoring capabilities. SAP's MAI (Monitoring & Alerting Infrastructure) simplified the monitoring views into categories including: Availability, Performance, Configuration, and Exception as seen below. After drilling in, there are metric and charts that could be displayed (Adobe Flash rendered), but the exceptions and alerts for categories such as ABAP dumps, Syslogs, Batch jobs only show total alerts in the last hour, day, etc. but not the actual errors themselves even after drilling in. So in a way, it's over-simplified to the point of 'how many exceptions am I getting?' from each monitored system. There is the Alert Inbox which you can launch from the Performance Overview of Events/Metrics and further drill down for alert details, but they stop short of individual alerts, only to show the number of alerts for those events and what the first/worst/last/min/max for those metric. For further analysis like when the event occurred, one would need to log into the managed system and use traditional SAP Basis transactions to analyze further, assuming those alerts/events haven't already been archived. There's a flaw with the above approach that it's not a single pane of glass, but rather an aggregated view which lacks troubleshooting context. I also noticed that it was quite slow in loading charts and performance information. What's been your experience with Solman 7.1 and do you think it's useful for SAP systems technical monitoring, or is it too much work to set up and maintain for the level of usefulness it provides? 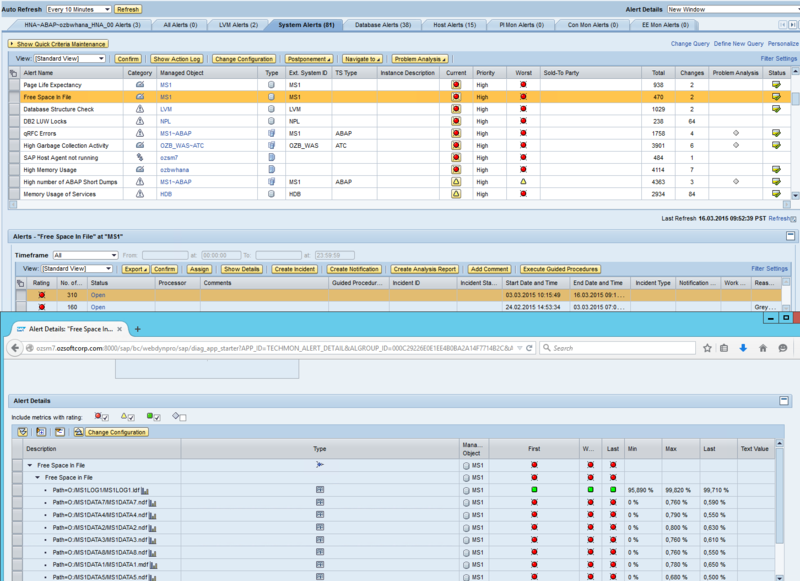 For a simpler alternative for SAP Monitoring WITHOUT Installation!